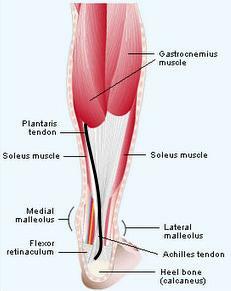 The plantaris is a long, thin tendon that runs from just above the knee to the back of the heel. A plantaris rupture feels just like getting hit in the calf with a hard serve. My first clue that I had a plantaris injury came when I checked behind me and noted that I was still alone on my side of the court – no phantom server, no rolling ball. My second clue came when I attempted to take a step and instead, collapsed in pain. Luckily, I was able to get immediate treatment that included cold laser, ultrasound and, of course, Kinesio Taping. Although I’m known as Tape Expert, this was my first opportunity to actually use Kinesio Tex Tape with an acute (and incredibly painful) injury. My initial taping was a multicolored criss cross “microcirculatory” or lymphatic taping designed to reduce the swelling and bruising. After a few days, I graduated to a “neurosensory” taping that dramatically relieved the pain whenever I put weight on my injured leg. I’m happy to report that, within two and a half weeks, I was back on the courts – this time with a “structural” application, designed to provide support for my traumatized calf muscles, while still allowing me to move freely through a full range of motion. Within a month, I was back running and playing tennis on my typical manic schedule, with no taping required and no pain or swelling. I now refer to my experience with tennis leg as the “best bad injury” I ever had. Watch for my next three posts, which will provide additional detail on the three taping techniques that I used Kinesio Tex Tape for: (1) the microcirculatory or lymphatic taping technique for relief of swelling, edema and bruising, (2) the neurosensory or decompression taping technique for pain relief, and (3) the structural or compression taping technique for providing support to injured or recovering muscles.